I recently received an email from Fr. Timothy Sawchak, of Holy Trinity OCA Church in Kansas City. He sent the above photo, of a mystery clergyman. It was, apparently, discovered at an old studio and given to Annunciation Greek Church, also in Kansas City. There was no writing on the photo, or markings of any kind, so beyond the image itself, we don’t have much to go on. Let’s see what we can determine from the photo. While my initial impression was that this is a bishop, on closer study, I don’t think it is. 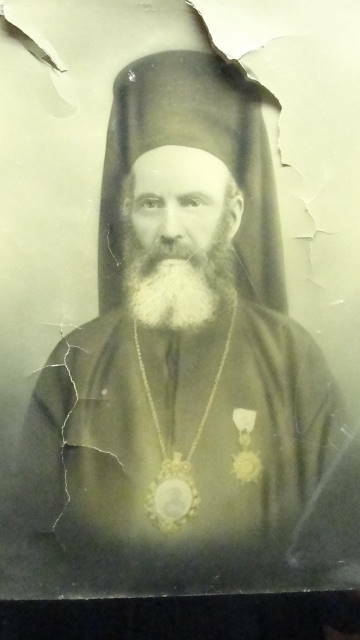 I have photos and/or sketches of most of the early Greek bishops in America, and they obviously aren’t this man. He’s not Meletios Metaxakis, or Alexander Demoglou, or Philaret Ioannides, or any of the other bishops I’ve seen. And he’s definitely not one of the Russian bishops. Most likely, he’s an archimandrite. Our mystery man is also wearing a medallion of some kind. 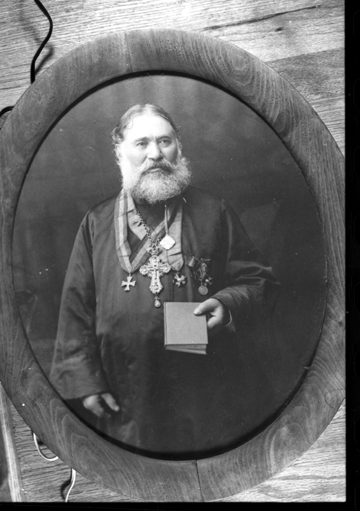 I know that the Tsar often awarded medallions to clergy under the Russian jurisdiction, but I also know that the Greeks of Kansas City were not a part of the Russian Archdiocese. Does anyone out there know if the King of Greece, or some other civil or church authority, gave out medallions like this? Rangos is described by the Kansas City Star (4/30/1913) as being 60 years old. Obviously, he’s wearing a different sort of hat, and both he and Panagopoulos had crosses — not icons — around their necks. But, as these are only rough sketches, it’s hard to draw any conclusions. Basically, I need your help. Can any of you identify the mystery clergyman in the photo at the top of the page? If so, please either leave a comment (below), or send me an email at mfnamee [at] gmail [dot] com. Thank you! Is there any chance he could be Serbian? It looks like the first Orthodox Church in the Kansas City area was St. George Serbian Orthodox Church, and they list one “Archmindrate Joanikije Markovich” as their priest for several different periods. Yes, it’s certainly possible that the priest is Serbian. 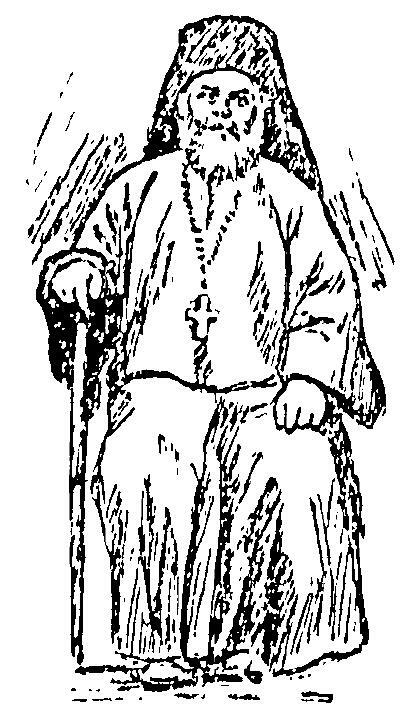 I can’t find any photos of the KC Serbian priests of the era, but it’s a distinct possibility. So you got me curious. St. Sava Serbian Orthodox Church in Milwaukee lists one of it’s early priests as “Archimandrite Hadji Joanikije Markovich-Decanac,” also from around that period (http://www.stsava-milw.org/history.html). Still no photos though. I’m not sure what “Hadji” signifies in Serbian usage, but if it’s any connection to the Arab usage (one that has made the Haj), that’s really odd. Hadji is a reasonably common prefix to Greek surnames. Mostly, I think it has to do with pilgrimage to the Holy Land during the time of the Ottoman occupation. One way of construing these surnames is that there may have been a man whose first name was Demetrios who went on a pilgrimage. His family could then be called Hadjidemetriou since this would be understood as “being of the family of the Demetrios who went on pilgrimage,” since Demetriou is the genetive of Demetrios. Among names that I have come across in Greece are Hadjidemetriou, Hadjinikolaou, Hadjigeorgakis and Hadjipetrou. One can pick almost any common masculine Greek forename, put a hadji prefix and a Google search will come up with people with that surname. I may be mistaken, but his pectoral icon does not appear to be of Christ. I see a man with his bare arms crossed on his chest, looking off to the left and downward. It is a familiar image, but I can’t recall who it is. You could be right, Mark. My impression was that the light color in the middle of the image was the Gospel book. If it is an icon of Christ, he’s probably holding a Gospel book with one hand and blessing with the other. Actually, I’m now thinking it is of Christ: the icon of “Extreme Humility”. Usually that icon has a Cross in the background. If this one does, it isn’t visible to my eyes. Funny, I thought the light color in the middle looked like a lamb…. 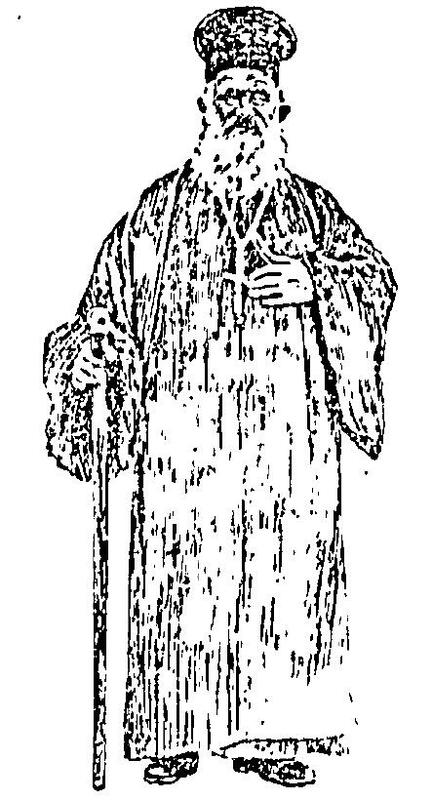 With the recent article published on Archbishop Dionysius I can’t help to notice a similarity between the sketch of him and this photograph. Joseph, I’m pretty sure it’s not Abp Dionysius. The mystery photo was found in a studio in Kansas City, and there’s no evidence that Abp Dionysius ever passed through that city. Also, from other images I have of Abp Dionysius (which I will eventually post on the website), it’s pretty clear that he’s not our mystery man.